I like old school but D&D but it’s not my favorite game. Gamma World is … by a long shot. D&D has always been a mainstay but I think I’ve more fun with Gamma World than any other game system. 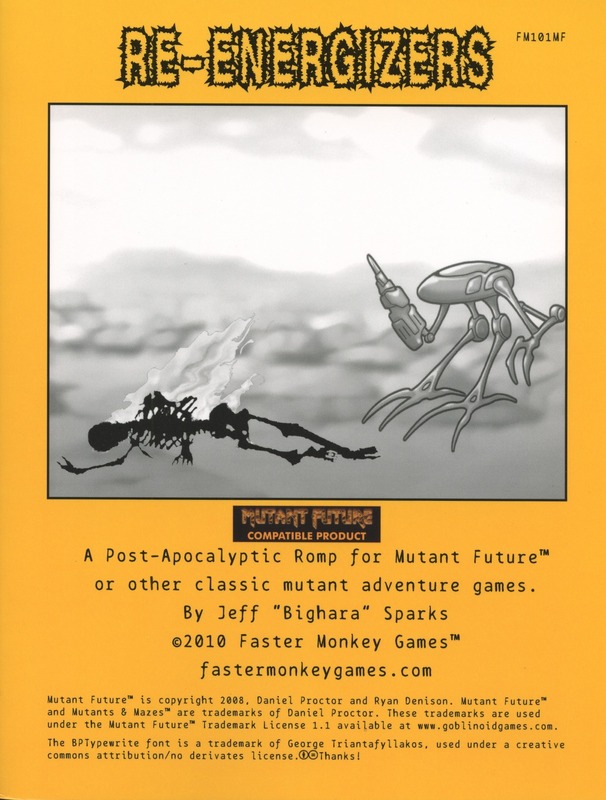 Re-Enegerizers is an adventure module for Mutant Future, a gamma worldish clone. The world presented here is a little different than most of the ones I’ve run, and maybe from many of the official GW modules I’ve seen. I got the distinct feeling that this took place a little closer to the apocalypse than many of those other settings. There’s a town, Xitnine (Get it! Get it?! Exit 9! Oh Gamma World, how I miss you …) that the party comes across while traveling. It has something many other town do not: some functioning defense bots stationed at the edges, watching the party as they approach. Once in the town the party is eventually approached by its boss who has a little job for them to do … he needs them to go down the road and find some new atomic batteries for his robots. The town is described in only pages two pages, large type pages at that, but you get a very good feel for how to run it. There’s really only three brief descriptions: getting in past the gate guards, the beergarden, and the talk with the boss, but just from those three I got a real strong vibe on how to run the place and what it was like. thugs running the town, but not necessarily evil thugs. A real marginal town out in the middle of nowhere. It reminds me a lot of those towns and bosses in those cheesy 80’s and 90’s post-apoc movies. There in lies the difference from this place and many of the others I’ve seen. I’m used to lower tech levels and greedier players. My players, upon being told to go get some batteries, would say “Sure”, go get them, and then fire up their fusion rifles and slag anything in their paths. Tech was always better than cash to my players. I’m not saying there’s anything wrong with this town or setting, but the vibe from it is quite a bit different then what I would have expected. The robot factory, for that’s where the batteries are, has four primary encounters in it. There’s an automated defense turret at the door, some mutant dogs near a garage outside, spider goat creatures inside and some beetles in the basement. There’s a couple of laser pistols scattered about and, as required by Gamma World law, a BIG RED BUTTON. BIG RED BUTTONS come in many form in the mutated wastelands. They all have one thing in common: curiosity gets the better of the players and they get themselves killed. In this adventure it takes the form of a radiation area near a hole in the fence. It’s a hot zone and gets only hotter the close the players get to a shed back there. The players will know it: they were given a geiger counter. Do they press their luck to see what’s inside, or do they ignore it as a death trap? That’s the BIG RED BUTTON and this is a fine and classic one. A search turns up the batteries and a couple of interesting items for mini-puzzles; post-it note combination solutions and the like. The factories not huge, maybe four sites outside and five or so inside, basically a big factory floor with a one room warehouse basement and 4 or so offices. There’s only one encounter on the way to the factory but it’s a nice one with a good set-up involving a body in the brush. It’s yet another SHINY SHINY RED BUTTON … can the players resist their curiosity or do they poke their noses in with the hopes of finding PHAT LOOT? Risk/Reward at its finest, and hopefully a motivator for those wacky PC plans that always lead to so much fun. The end of the adventure has the boss NOT double-crossing the party for a change, well, not very much anyway. 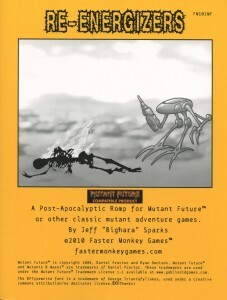 This would make a good pick up and play adventure for a night of mutant mayhem. There’s nothing world shattering, it’s easy enough to follow without a full read through, is short enough for an evening of play that includes some fun in town, and is not too generous with the loot. Tech weapons are always a fine line in these games; there’s not too much here and what there is can be modified by the GM to lessen the impact, if need be.